What are control accounts? Why do we need them? In this lesson we're going to answer these questions and more. We also learned that all individual debtor T-accounts go in the debtors ledger and all individual creditor T-accounts go in the creditors ledger. Now, as far as we know, debtor and creditor T-accounts only go in the debtor and creditor ledgers, right? None of the information about debtor or creditor T-accounts goes in the general ledger, right? The general ledger does contain information about debtors and creditors. In fact, it contains two special accounts relating to the above, called control accounts. Why Are These Called "Control Accounts?" The reason these accounts are called control accounts is because one uses them to ensure there are no errors or mistakes in our records relating to debtors and creditors. Thus one gets more control. I will show you exactly how this is done shortly. Control accounts are essentially summary accounts in the general ledger. They contain totals instead of amounts relating to individual debtors or creditors. They allow one to see the totals, without getting into too much details from individual accounts. Where Do the Totals for the Control Accounts Come From? Entries in the control accounts such as "total sales", "total purchases" as well as "bank" come from the relevant accounting journals. For example, the "total sales" figure of $16,300 in the debtors control account above comes from the total in the sales journal below (which shows sales on credit). Similarly, the "total purchases" figure of $3,900 in the creditors control account could be traced back to the purchases journal (which shows purchases on credit). And the "bank" figure of $6,000 in this same account could be traced back to the cash payments journal (which shows all payments of cash). The debtors control account is also known as the sales ledger control account. This name is sometimes used for this account because it reflects the total of the individual sales on credit (sales to debtors), as reflected in the sales ledger. Likewise, the creditors control account is also known as the purchases ledger control account. Again, this name is used because it reflects the total of the individual purchases on credit (purchases from creditors), as reflected in the purchases ledger. So How Exactly Do These Control Accounts Ensure There Are No Errors? For debtors, we compare the closing balance of the debtors control account in the general ledger to the total of all the closing balances of the individual debtor accounts in the debtors ledger. As you can see above, the debtors control account has a closing balance of $10,700. The debtor T-accounts come to the same figure ($8,000 + $1,400 + $1,300 = $10,700). If the debtor T-accounts came to a different figure – let's say $11,000 – we would know for sure that there was some error, either in one of the individual debtor accounts in the debtors ledger or in the debtors control account (general ledger). And we would then go about trying to find that error and then correcting it. Traditionally bookkeepers or other accounts personnel perform a reconciliation on a regular basis between the control accounts (general ledger) and the total of the debtors or creditors ledger. The word reconciliation actually comes from reconcile, which means to make two amounts agree in value. Accounts personnel may even produce a debtors or creditors reconciliation statement, which is a report showing the discrepancies between the control account (general ledger) and the total of the individual T-accounts (in the debtors or creditors ledger). So that's our lesson on control accounts. I hope it helped shed some light on this important topic. Next up, we're going to tackle the penultimate step in the accounting cycle - the trial balance. 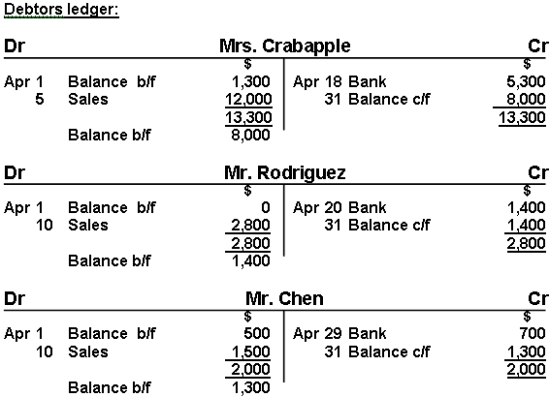 Click here to check out the next lesson on the trial balance. What does it mean when there is a debit balance in a sales control account? Q: How do you deal with a trade discount in the control accounts? Q: What is the entry for the following? Sold goods to R. Botha on credit of R242,39. Issued invoice 001. Carriage Inward included in Creditor's Control Account? Q: What are the major errors located by the trial balance? Q: What is a cash receipt journal? A: See the lesson on accounting journals. Payment of Creditors: Which Journal?